The name Goldsmith’s Orchard Market is well-known in the Georgian Bay area. Now, the popular market is under new ownership – and new owners Brad, Teresa and Kyle Oakley are excited about what it will mean to their family’s fruit and vegetable business. 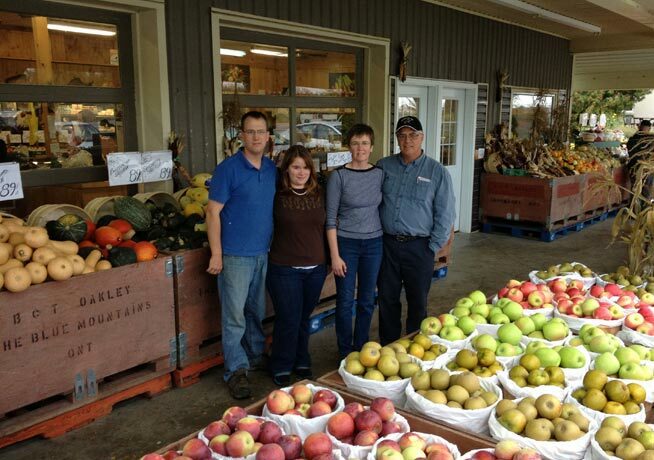 Brad and Teresa bought the family’s first farm – 100 acres with a few apple trees on it – in 1984. The Oakleys now own 335 acres, with 200 acres in orchard, 40 acres of vegetables and sweet corn, and the remainder of the land rented out to local cash crop farmers. After graduating from the University of Guelph, Kyle worked off the farm learning the meat trade before deciding to return home three years ago to join the family business. The Oakleys’ main crop is apples, growing primarily McIntosh and Northern Spy but looking to add new varieties like Gala and Ambrosia when they start replanting their orchard in 2014. They also grow raspberries, tomatoes and peppers in high tunnels, as well as field tomatoes and cut flowers like gladiolas and other smaller varieties. “We’ve always produced strictly for the consumers coming to our tent and we tend to grow a bit of everything under the sun to meet their demands,” Kyle says, adding that the new farm market includes a bakery as well. Kyle is also active in social media, using Twitter and Facebook to reach out to consumers about how food is produced. For him, Facebook is providing more of a response than Twitter, but he says both are important to due to the heavy tourism in the Georgian Bay area. Common questions he gets concern the use of genetically modified organisms (GMOs), organic versus conventional production, and labour practices. The Oakleys rely on seasonal workers on their farm, many of whom having been coming there to work for many years through the Seasonal Agricultural Worker Program (SAWP). Unlike other foreign worker programs, SAWP is open only to workers from Mexico, Jamaica, Trinidad & Tobago, Barbados and the eastern Caribbean islands, and is governed by formal, four-way employment agreements between the worker, employer, foreign government and the government of Canada. Program participants are eligible for the same health and pension benefits as Canadian workers are, and for the Oakleys, along with many other Ontario fruit and vegetable farmers, these seasonal workers are an indispensable part of their farming businesses. Kyle also credits his parents with helping him get a start in the family business. Farm family succession can often be contentious, so he’s appreciative of Brad and Teresa’s good communication and open approach. Both are still actively involved in the farm with Brad managing the day to day orchard and vegetable operation while Teresa works in the farm market, manages the bake shop and handles the books. Kyle’s fiancée, Debby, who works full-time for Peel Region, does social media in the evenings and works in the store on weekends. You can follow the Oakleys on Twitter at @goldsmiths_mkt or like them on Facebook at www.facebook.com/pages/Goldsmiths-Orchard-Market/121611597849597. Story by Lilian Schaer, photo courtesy of the Oakley family.